While looking for possible sources of Visual Levitation kits or parts, I found some of the companies related to its manufacture. It is my hope that the kit eventually goes into production again. Here is a short overview including contact information, to make it easier to check availability. Please search the Applegate Directory for the latest information about technology and manufacturing in the UK and Ireland. The electronics was designed by the Magnetic Suspensions of Cardiff. They also have a relationship with Wolfson Centre. The Isle of Man company with the similar name (below) was a distribution point. The distribution company was located on the Isle of Man. There seems to be a large number of companies on this small island in the Irish Sea; apparently it offers some popular tax advantages. The lifting coil assembly appears to have been built by Coils UK of Ebbw Vale, UK near Cardiff. They have possibly built the whole kit. If you're building your own levitator, it may be possible to contact UK Coils and see if they can produce a few of the coils. They might be able to if they don't consider the work proprietary. An article from Electronics Weekly said "Coils UK offers a variety of coils, coil winders, and solenoids. They also design and manufacture coils to your specifications." Assuming they are still in business. The Wolfson Centre has a relationship with Magnetic Suspensions Intl. This is probably where Dr. Shirazee studied while he was in Cardiff University. After the web site for Visual Levitation was removed, visitors were redirected to Aussie Magnets in Melbourne, Australia. However, their catalog has not carried the device for a couple years now. This company offers a magnetic levitation device based on patent application 20040052029, which in turn is based on Dr. Shirazee's patent. They offer the "IFO 3000" for about $100US. However it is not set up to support as much weight (max. 12 oz). 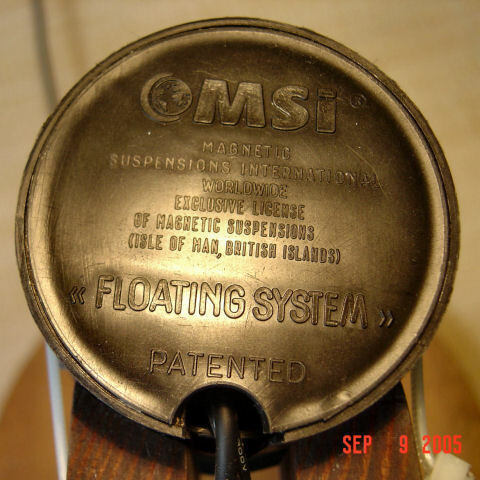 Floating Ideas is the gift manufacturing division for IFO, Ltd (Identified Flying Objects). They are British owned with a factory in Shenzhen, Southern China. Apparently this is one of many businesses (e-businesses) out of the Isle of Man due to its tax advantages.